Marshall head coach Doc Holliday disputes a call during a Sept. 8 football game against Eastern Kentucky at Joan C. Edwards Stadium in Huntington, W.Va.
HATTIESBURG, Miss. — This one slipped away. 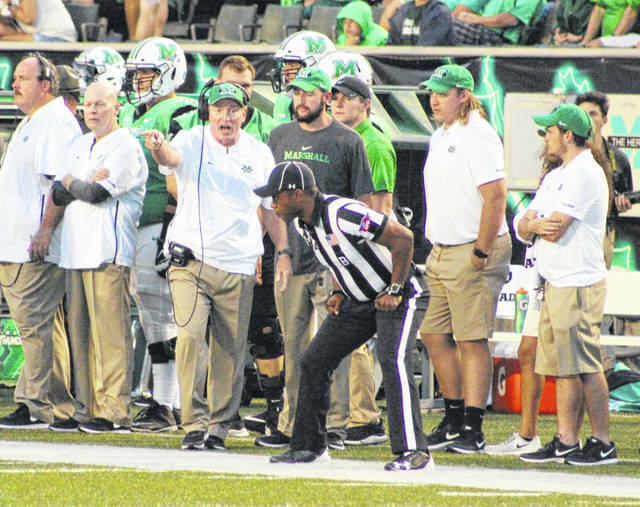 Marshall committed four turnovers that resulted in 17 points and produced a season-low in rushing yards Saturday during a 26-24 setback to host Southern Mississippi in a Conference USA contest at M.M. Roberts Stadium. The Thundering Herd (5-3, 3-2 CUSA) suffered their first road setback of the season, but the Green and White had as much to do with final outcome as their storied counterparts. The Golden Eagles (4-4, 3-2) stymied a Marshall ground attack that was averaging 148.5 yards coming in as the Black and Gold allowed just 31 yards on 22 carries. The hosts also held MU to zero rushing yards in the first half on 11 totes. Still, the Herd managed to take their only lead of the game late in the second quarter as Brenden Knox recovered a fumble and returned it eight yards, making it a 10-3 Marshall lead with 5:04 left in the half. The Golden Eagles followed with another fumble on their next possession, but the guests returned the favor two plays later with an interception that gave Southern Miss the ball at the MU 46. Five plays later, Quez Watkins hauled in a 4-yard pass from Tate Whatley to knot things up at 10-all with 48 seconds remaining until halftime. Marshall’s first offensive snap on the ensuing drive turned disastrous as Darian Yancey scooped up a fumble and returned it 17 yards to the house — giving USM a 17-10 edge with 33 seconds left. The Herd managed to tie things back up with their second possession of the third period, marching 66 yards in four plays to accomplish the feat. Anthony Anderson plunged in from two yards out at the 8:36 mark for a 17-all contest. The hosts punted on their ensuing drive, but got the ball back following an interception that gave USM the ball at the Marshall nine. The Golden Eagles mustered only three yards on four plays, but ultimately secured a permanent lead of 20-17 with a 23-yard field goal by Parker Shaunfield with 2:58 left in the third. Marshall was forced to punt the ball away on its next drive, which ended up moving the game into the final period. The hosts strung together a 13-play, 94-yard drive that ended with 1-yard Whatley run, making it a 26-17 contest with 7:13 left in regulation. The Herd started their ensuing drive at the 37, then covered 42 yards in seven plays. The eighth play, however, proved to be bittersweet as a 17-yard pass completion to Tyre Brady — his only catch of the day — ended in a fumble. The Golden Eagles recovered at their own four and took over on downs with 4:19 left. That drive eventually led to a punt that gave Marshall the ball back at the USM 46 with just over three minutes showing. MU needed 10 plays to cover the distance as Isaiah Green capped the drive with a 15-yard pass to Artis Henry, making it a 2-point contest with 1:11 remaining. The Herd came up empty on their onside kick attempt, giving the hosts the ball at midfield. The Golden Eagles took two knees to run out the clock and wrap up the victory. The Green and White claimed a 15-13 edge in first downs and outgained the hosts by a 249-222 overall margin in total yards of offense, but also finished minus-2 in turnover differential and minus-10 in points off of those six total giveaways. Shaunfield gave Southern Miss an early 3-0 lead with a 45-yard field goal at the 7:25 mark of the opening canto. MU ended the first quarter by tying things up on a 24-yarder from Justin Rohrwasser as time expired. Both teams punted the ball five times apiece, with Southern Miss claiming a better average (36.6 yards) than Marshall (32.4) on those boots. The Black and Gold also won the time of possession battle by having the ball for 38:13 of the 60-minute affair. The Herd was penalized seven times for 79 yards, while the hosts were flagged 10 times for 90 yards. Keion Davis led the MU ground attack with 22 yards on six carries, followed by Anderson with 18 yards on nine attempts. Green completed 12-of-25 passes for 169 yards to go along with one touchdown and one interception. Alex Thomson was also 5-of-13 passing for 49 yards and a pick. Marcel Williams led the guests with seven catches for 139 yards. Obi Obialo was next with four grabs for 32 yards. Nazeeh Johnson led the MU defense with nine tackles, with Chase Hancock and Ryan Bee each contributing seven stops. Hancock and Omari Cobb also recorded a sack apiece in the setback. Knox and Chris Jackson also recovered fumbles for Marshall’s only takeaways. USM — which produced only 88 rushing yards on 45 attempts — was led on the ground by Whatley with 40 yards on 25 tries. Whatley was also 16-of-25 passing for 134 yards and a scoring pass. Watkins led the Golden Eagles with 79 receiving yards on five catches. Ky’el Hemby led the hosts with five tackles and also had an interception, as did Ty Williams. Darian Yancey and Racheem Boothe each recovered a fumble, while Jeremy Sangster, Sherrod Ruff and Jacques Turner had a sack apiece in the triumph. Southern Miss now owns an 8-6 overall advantage in the head-to-head series with Marshall in CUSA play. After losing five in a row, the Golden Eagles have also won three straight against the Herd. Marshall returns to Joan C. Edwards Stadium on Saturday when it hosts Charlotte in a Conference USA contest at 2:30 p.m.